This month the angels bring us moldavite. This fascinating green crystal is a form of tektite that only comes from one source – a meteorite that crashed into a Czechoslovakian mountain around 15 million years ago. This makes the stone very cosmic and curious indeed, and quite literally ‘out of this world’! I find it interesting that tektites are extra terrestrial or origin, yet also merged with our earthly terrestrial matter. It is a very rare crystal, in fact rarer than diamonds, so you might find it to be a little more expensive than some other crystals. In ancient times it was said to be a highly mystical crystal that made wishes come true. It has also been referred to as the ‘Holy Grail’ stone, having fallen from the sky – legend has it that the holy grail used in the last supper may have been a mystical chalice filled with magical power with moldavite on it. It is intensely high vibrational as it carries a very high frequency, so perhaps use it in moderation while you get used to its uber powerful energy (be careful not to get overwhelmed or dizzy – if you have a rose quartz crystal, use it together with moldavite – that should help settle down the intensity, and hematite is helpful to ground you). Moldavite is a fantastic tool for working with spirit / outer-world realms and developing one’s psychic gifts. It gives strong psychic protection in that wearing it protects and clears your auric field from having blockages or negative entities / energy attach. It is said to be very powerful when worn as jewellery, as it mystically interacts and flows with your energy. It will ensure that any outside energy you are working or communicating with is of the light. Moldavite also is an excellent tool in meditation and dreamwork. It can help you connect with your guides, raise your vibration, gain insight, and enhance the likelihood of synchronistic events. It will boost the vividness and substance of your dreams, as well as aid in lucid dreaming and astral travel. Other stones that work well with it are quartz (great in meditation), citrine (helpful for mind clarity), amethyst or larimar. Being a clear, deep green stone, moldavite is directly linked to the heart chakra. It implements releasing, healing and awakening of the heart and one’s sense of knowing, while also facilitating change and transformation. It is a powerful stone that acts as a spiritual catalyst for one’s personal growth, bringing about self discovery and enlightenment. If you have moldavite on or near you, get ready for evolutionary change!! It will expand your cosmic consciousness and accelerate your journey. If you feel you are of star origins or like you never really fitted in, as you felt quite literally like you were from another planet, then moldavite will greatly assist you. Hold on to your outer space hat! The idea of prosperous growth that was mentioned in June is filtering through now in August. There is the potential to be rewarded, a sense of balance, and more emphasis on abundance rather than lack/ For some, practically speaking, this might relate to tax rebates, windfalls, helpful loans, paying off debt, gifts etc, for others, financial or business growth, or perhaps a more noticeable fertility of projects, resources, prospects and ideas. It will mean something different to each person. So it’s a very green and fertile month. •manifest on the new moon by writing an abundance cheque. •look closely at your past dealings and attitudes about money – how have they shaped your views today? 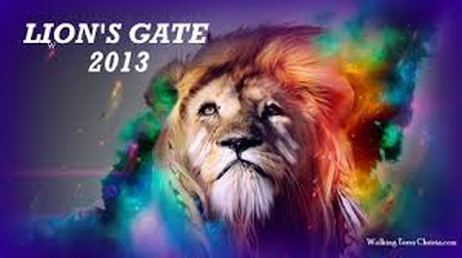 LionsGate: 29 July – August 12th, 2013 Energy Report: Okay folks, this will explain current energies and the connection to why many of us are noticing cat/lion signs (or feel a connection with or have dreams about any members of the cat family, or cat beings, or Egypt) – much synchronicity and magic is happening…. A massive portal opening up, a vortex from Syria (a planet very connected to earth filled with light beings that guide us) is allowing a huge wave of light from the galactic centre, to us on earth, which is activating new ‘light codes’ – from the Syrians. This will bring more divine light / energy on earth, link with earth’s grids, and forge a greater connection between the earth and the sacred cosmos. When you look at it from a larger perspective, it is an initiation and linked with your dna. At the end of the day it is a major boost to our united consciousness as well continue our path to enlightenment and increased vibratory frequency. What have you been experiencing in your life and what are you wanting to change? What is resisting your forward path? Does it come from you internally, or someone or something outside of yourself? Breathe out whatever you are holding on to or that is holding you back. Do you feel that you are in the ‘in between world’ hanging in suspense? This is a time of ‘moving on’ – it is time to take a leap of faith. The divine sense of ‘perfect timing’ will be running through this month. You are awaking ancient wisdom within you, a deep sense of inner knowing that is emerging within us all. You may or may not be feeling that right now or tapping in, but the power and energy is there for us, we each hold it with in ourselves, when we are ready — but be careful of doubting yourself or procrastinating!!! I feel the same way as that quote!! So trust and follow your intuition. Be receptive and allow information to come to you. Accept what is and look forward to a new, long anticipated ‘lightness’. It is time to really remember who you beyond the surface coverings, defense-mechanisms, doubt, fears and illusions. You are embarking on a new adventure. Clearing clutter during this time lightens the load, clears the slate and opens new pathways. It is a time of fertility and prosperity – with new open doorways. Trust in the process and know that you are in that flow. Pay attention to any unexpected opportunities and trust in your divine heart.